This Do-It-Yourself Electrolyte Sports Drink can be used any time of day to stay properly hydrated or before or during your workout to boost your nutrient intake and replenish electrolytes. Hydration is not just important during your workout but also before you embark on on a long run or any other kind of endurance training. Within 20 minutes before exercising, drink plenty of water with electrolytes. This will support your performance. Mid-work hydration is key to keep your body moving. Your blood flow increases, delivering oxygen more efficiently to your muscles and your body can eliminate waste more easily. Electrolytes are essential to keep your body in balance! They help move glucose and other nutrients into your cells, and help remove waste products, such as lactic acid, from your cells. When you’re properly hydrated, your lactic acid build-up slows down so you can go on longer. How much fluids you need to drink depends on many factors. The intensity of your workout, the kind of weather you’re exercising in, your daily diet, your daily fluid intake and how much you sweat. If you sweat a lot, you lose essential minerals that keep you going. Listen to your body to understand its unique needs. When you feel thirsty or experience muscle cramping, it’s too late already. If you are working at high intensity, make sure you stay hydrated by drinking an electrolyte-rich sports drink every 10 to 15 minutes. Most store-bought sports drinks are loaded with harmful and unhealthy sugars, like high fructose corn syrup and sucralose. This Electrolyte Sports Drink is a natural way to replenish electrolytes and boost nutrient intake before or during a high-intensity training. It’s so easy to make your own sports drinks and making your own is so much healthier than buying them in your local store. The small amount of easily digestible plant-based sugars in the dates, agave nectar and fruit juice fuel your muscles immediately pre and mid-workout, so you go on for longer. 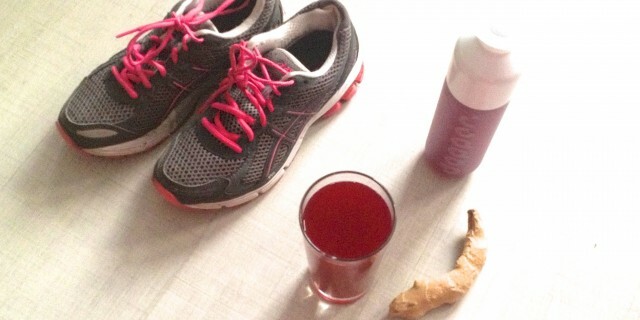 Fresh ginger is a potent anti-inflammatory agent that reduces inflammation and aids in aids in muscle recovery. Young coconut water and sea salt provide essential electrolytes lost during an intense training session. The Yerba Mate tea is not only packed with minerals, vitamins and antioxidants, it’s also a stimulant as it contains caffeine but without the usual side-effects. It gives you a bit of a boost and can even improve your performance. Add all ingredients to a high-speed blinder, pulse and enjoy!